If you are a Connecticut tenant and your attempt to have your security deposit returned from the landlord either through a security deposit request letter or any other way has not been successful, then you need to send a security return demand letter. According the provisions of the state laws, if the tenant leaves the property without any critical damages beyond regular wear and tear, having paid all their rent and observed the terms of the lease, they must be paid back their security deposit within 30 days after they leave the rented property or be furnished with an itemized statement of deductions along with the balance within the same period. If the landlord has failed to pay the owed amount within the statutory time as required by the Connecticut state laws, the tenant can file a dispute in court. However, the court procedure take a lot of time and could also be stressful. Our professionally written Security Demand Letter is meant to warn the landlord of the severe legal consequences they face if the matter ends in a Connecticut court. This is the most effective way to have your landlord return the owed security deposit fast, without going to court. With this letter, you can effortlessly get back your security deposit and all you need to do is download it, fill and send it to the landlord. Always remember that any communication or agreement reached with the landlord should be documented in writing to have proof if the matter ever lands in court. You should also save yourself a copy and send the letter via certified mail to get a return receipt. 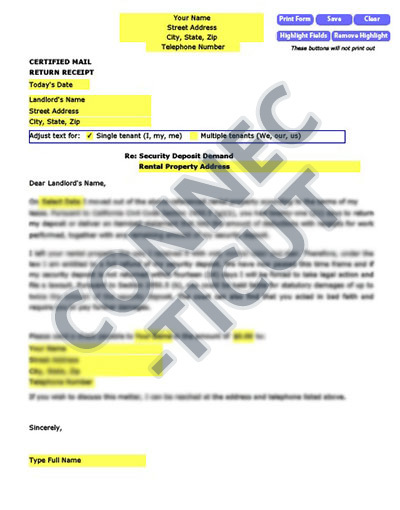 Our letters for Connecticut Security Demand Letter renters are tailored to your state, with the right laws to get your landlord’s attention. We’ve taken care of the Security Demand details so there’s no hassle on your part to find the right law and craft an approrpriate letter. Our letters have been used in Connecticut Security Demand Letter and all over America with great success.